On the reverse of the glass is a circle outline enclosing three grain stalks, bound at their base, pictured against a barrel end. To either side of the stalks is tsp TRADE MARK. A panel slanted across the design reads BONNIE, and arched above the circle outline is REG.IN.U.S.PAT.OFF. Dimensions: 4-7/16" x 1-15/16" x 1-13/16"
Condition: There is a rim depression that is rounded over and occurred during manufacture and minor scuffs and scratches from handling, but there are no cracks, chips or dings and the inscription is very strong. 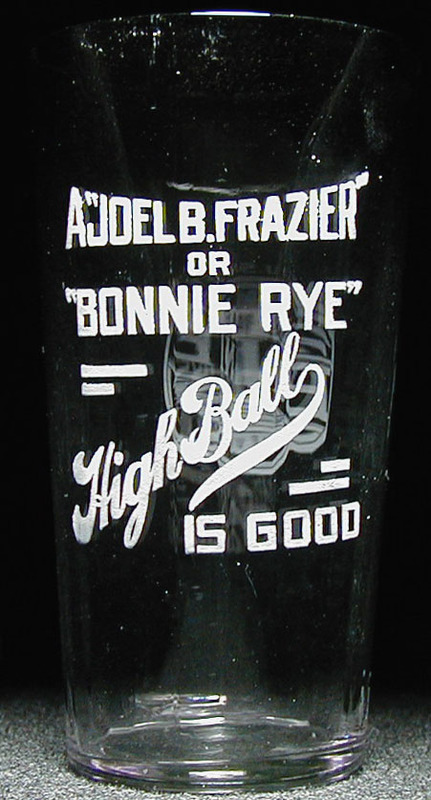 A rare fancy highball glass!